Bryan J.L. 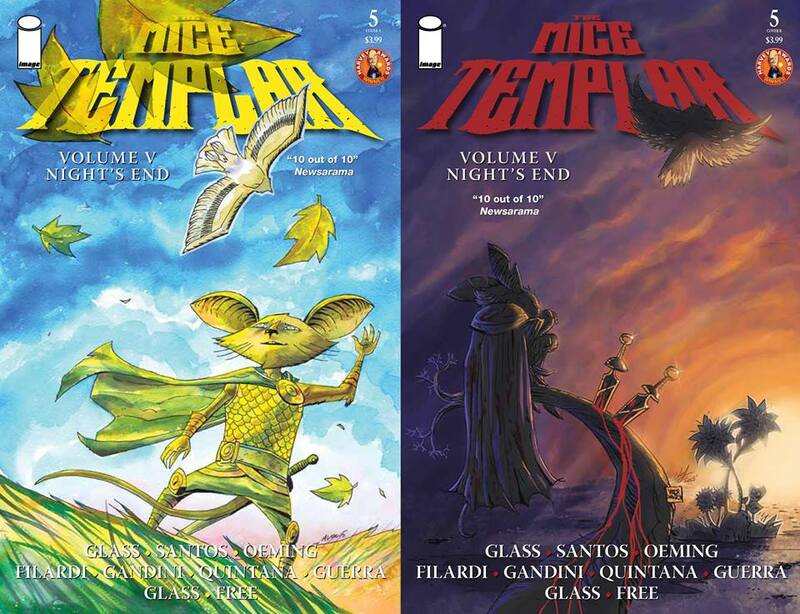 Glass and Victor Santos’ last team-up was on Mice Templar from Image Comics. This time, they give us something completely different. Whereas Templar is epic and far reaching, Furious from Dark Horse is more contained, but no less spectacular. Yes, the last few years have seen almost as many superhero parodies/deconstructions and re-imaginings as straightforward superhero tales themselves, but brightly coloured beings with amazing powers will always be an intriguing prism through which to examine the best and worst of humanity. Fame does the same, and when those two things are combined, you get Furious. This premiere issue is smart and thrilling, and as anyone who’s read the preview can attest, it looks great too. The titular character describes fame as a spoiled brat which always screams for more. Two months ago she debuted, calling herself The Beacon, but a loss of cool on camera meant the media gave her a new unwanted name – Furious. This is a mature comic, with mature language, and an intensity and desperation that floods the pages. Furious is a wonderfully nuanced character. Glass employs a delicate touch here, making certain that she is frightened and uncertain, but with noble intentions. She only wants to do good with the abilities she’s been given but she soon realizes that the old saying is true. No good deed does indeed go unpunished. There’s more at work here than just another jaded look at “superheroes in the real world.” Glass has something interesting to say about what’s expected about those rare, skilled individuals who we so easily put on a pedestal. What does that do to the individual? What does that do to those of us expecting them to be miraculously better than us? Public meltdowns are increasingly common of course, and that just adds to the authentic and relevant approach Furious is aiming for. 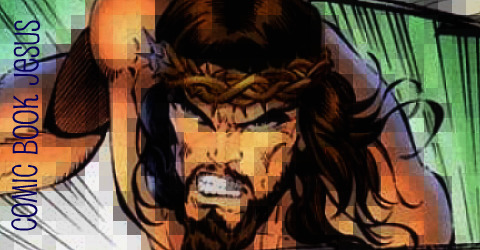 Santos’ art is angular and dynamic as always and his colour choices are meaningful – well-lit and exciting when Furious is flying after a distraught mother kidnapping her child, and full of shadow during scenes of Furious’ anger and doubt. 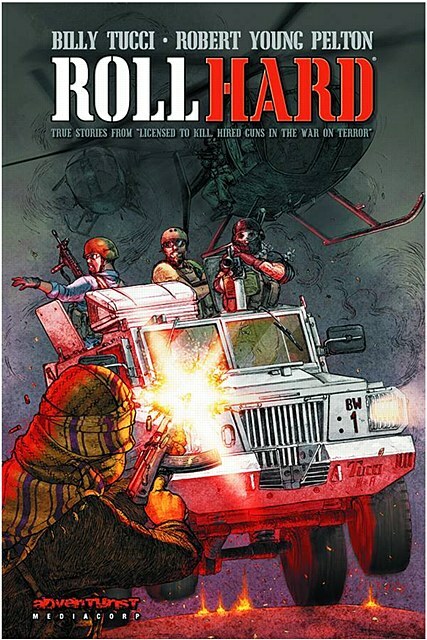 Eagle-eyed readers will see some interesting visuals, such as the nod to Santos’ recent Polar OGN, and Glass also nods to some of his fellow talented creators in a back-up collage page showing some in-world reactions to Furious’ debut. There’s also a familiar figure in one scene that made me do a double-take and just reminded me that Glass and Santos are building an intriguing story with more layers than a lasagne. 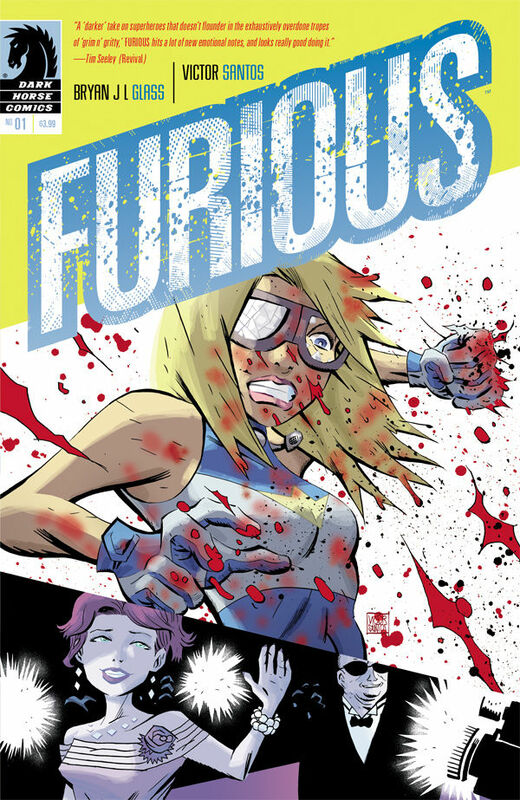 Furious is a young woman with some standard superpowers (speed, strength, flight) and although her origin isn’t explored here, it’s not really needed. 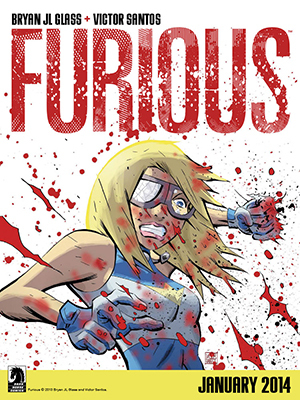 Furious brings her hurt past with her to her present decision making, and that’s make for an interesting protagonist. Underneath the bright costume and the desire to just do good, is a fragile woman who just wants acceptance, and who doesn’t want to be judged by a bad deed or two. The remaining three issues are sure to be as dazzling and provocative as this debut. It’s obvious that the story is perched on a rickety rollercoaster track. It will all lead somewhere dangerous and exciting. 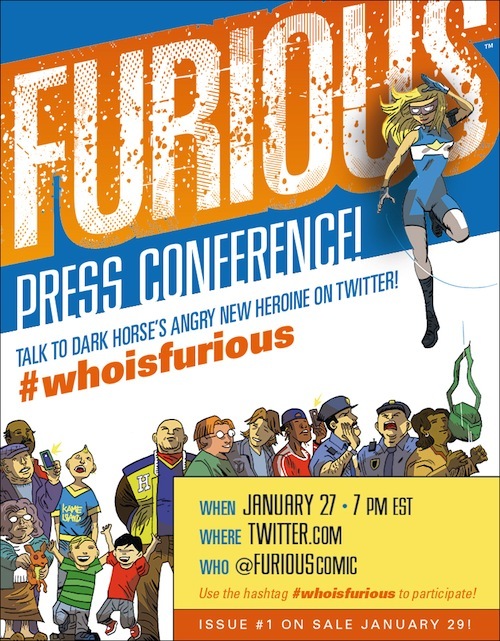 Furious #1 will be released from Dark Horse Comics on January 29 and you can even participate in a unique press conference on Twitter with the star of the comic!